From their blue jackets to their brass section, Hope & Social are a band who like to do things differently. Wearing their hearts on their sleeves but never taking themselves too seriously, the Leeds-based band have for some years now been funding their music through a range of unique projects with the proviso that everything they do must be interesting and, more importantly, fun. In December, for example, they held a Secret Santa event where they made people’s past and present Christmas wishes come true, and a few years prior they played 12 Gigs of Christmas around Leeds city centre in a single day. They’ve also taught local community groups to play their songs and join them onstage at gigs, taken a bus full of fans to the seaside and have regularly charmed North East audiences at Durham BRASS Festival. 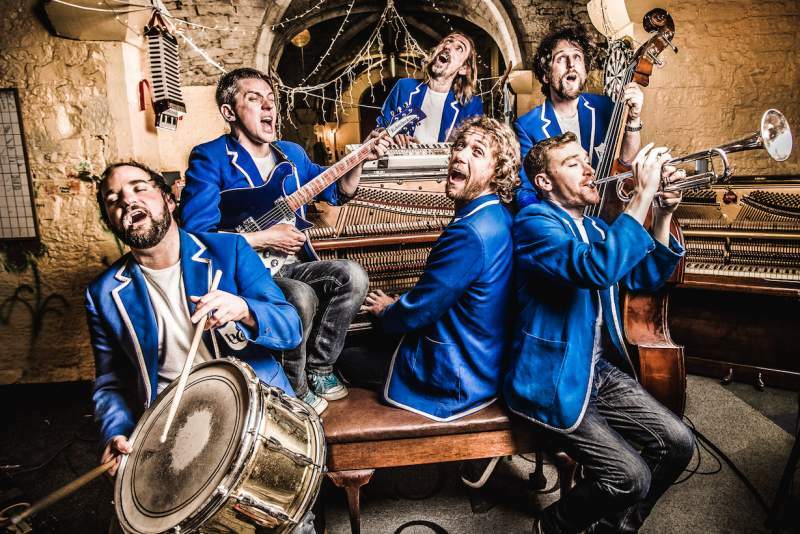 Their gigs are always brilliantly entertaining and exuberant occasions – they prefer the words ‘shambolic’ and ‘carnage’. They’re bringing their irrepressible noise and joyful abandon to Stockton’s ARC on Thursday 14th March before locking themselves away to record their next album. Don’t miss it!